It’s been froggy weather lately. In fact, I don’t think I’ve seen sun in nearly two weeks. And so in all of this rain and cold weather it was only appropriate that I would spend time indoors in a Frog and reptile photography workshop. This was a special photography workshop held in St. Louis, Missouri that was conducted by the accomplished photographer Jim Zuckerman. In fact, Jim and his friends who own the frogs and reptiles have been offering this workshop for past ten years. Each critter that was brought out needed their own personal handler as you can imagine…frogs jump. Some were so small, that you didn’t dare take a step when they jumped in fear that you might step on them. 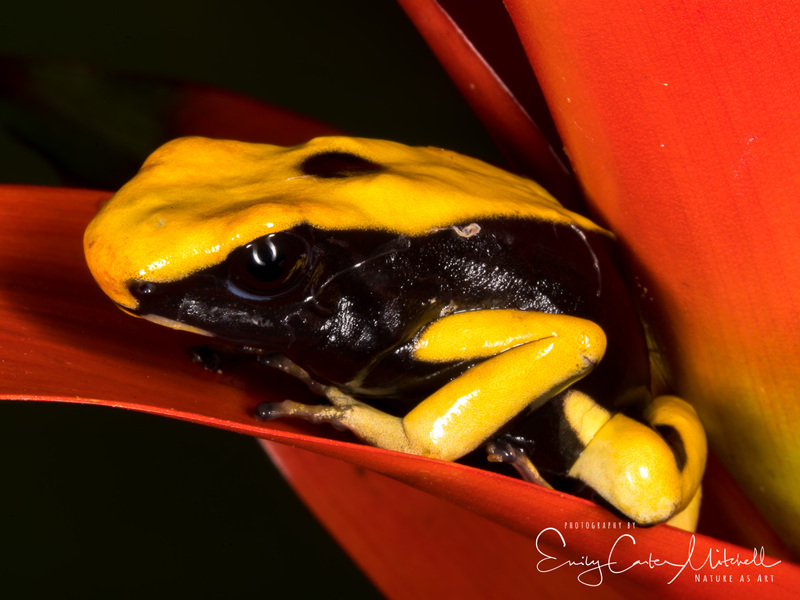 Brightly colored poison dart frogs on brilliantly colored tropical plants brightened the dreary days we’ve had. While these frogs are poisonous in the wild, when in captivity due to the change in their diet these frogs lose their toxicity. We saw a wide variety of frogs, geckos, lizards and snakes during the two-day workshop. It was an intensive six hour a day shoot, and each participant patiently awaited their turn to try to get the best shot of the frog before he hid behind a leaf or jumped onto the back drop. It is hard to say which one was my favorite. They were all charming in their own right. Even the snakes, as those who know me KNOW I HATE SNAKES ! Actually this cute little Kenyan Sand snake perhaps cured me a little of my fear/hate/repulsion of them. As soon as you set him onto the sand, he’d bury himself and then stick his head up to look at the world around him. Only four months old, these snakes grow to be three to four feet long. In photographing these small creatures, we had to think Macro in terms of our equipment. Taking my Canon 5D Mark IV, I used both a 60mm and a 100mm Macro lens, adding Kenko extension tubes, and Neewer Ring Flash (not the LED version). One of my friends tried another type of flash that attached to his Canon 580EX II flash unit. This was the ExpoImaging Ray Flash. The advantage to this was that there was less shadowing and the light was slightly diffused. A less expensive option is the Coco Flash Adapter Rig. Handholding our cameras for the most flexibility, we used Manual mode, ISO 100 – 400, f/32 for the greatest depth of field and our shutter speeds with the flash unit for 1/200 – 1/250 of a sec. I used Auto White Balance, and others used Daylight White Balance. I got a great number of amazing images during the weekend shoot. Upon returning, I began to work on them only to realize that my attempts to clean the camera sensor before I left failed and I had at least 50 little spots throughout the frame. So I had to painstakingly clean up each image to remove all of the dirt spots. Perhaps it is time I leave it to the Canon professionals to do. 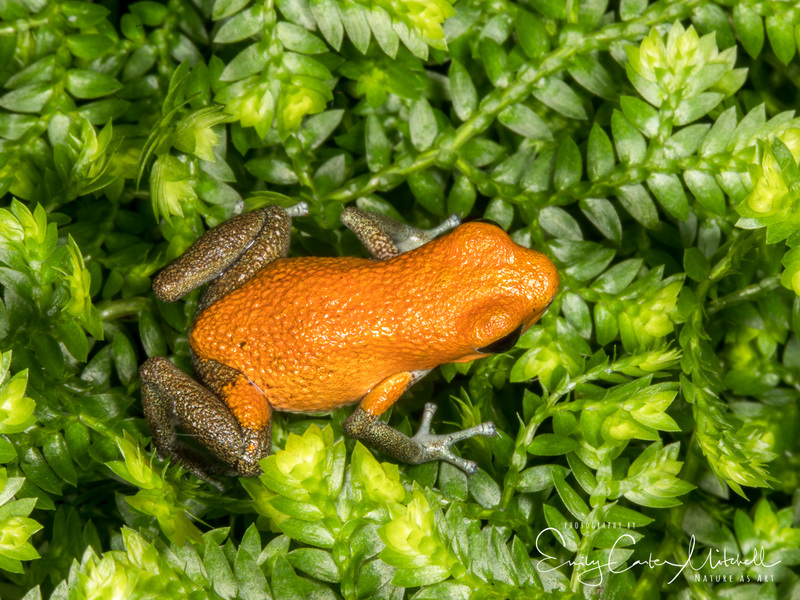 Please click through and view my photo album of these fascinating frogs and more. Enjoy and may we see sunny days soon. What beautiful captures on such uniquely coloured subject matter – these are simply glorious Emily! The colors were truly spectacular Joanne. If you could have only seen how small some of these frogs were. I’m trying to ID them tonight. Tough to do. Yikes, good luck with the ID’ing – don’t envy you at all! Sounds like a lot of fun. Excellent shots! It was amazing, and exhausting. Took me a couple of days to recover from such intensive shooting. Thank you Belinda. It’s so wonderful to hear from you Perpetua, and I think of you often. I hope all is going well with you and you have some fun adventures planned for this year. Thank you so very much for your very generous compliment. You humble me. Hugs my dear ! These are amazing, Emily. I love, love, love all the photos, and the colors are great for brightening up the long grey days we’ve been experiencing. I looked at them on your SmugMug site too. What a terrific gallery. Your photography is excellent and still seems to be growing by leaps and bounds (and a lot of hard work, of course). You are so very kind to me Carolyn, and thank you so very much. Funny, Facebook reminded me of a post six years ago. It was my first photo outing with my new DSLR. Wow…you’re right, such a huge difference. The journey has been full and fun. Can’t wait to see what the future will bring. They were so small. I loved spending time with them but glad I don’t have to take care of them. Thank you Fatima. Wow! It takes great skill and creativity to capture shots like these. I have to say I’m a little jealous (I mean it in the best way). 🙂 Congratulations on the colors, on the lighting and the sharpness. Terrific work! Thank you so very much for your kind and generous compliment. I’ve learned that opportunity is 60% of getting the shot. The rest of technical and compositional skills. Thanks again. What a wonderful event for photographers! The eyes on the yellow and black frog are huge! Who knew? It’s amazing Judie. Thank you so much. As you can imagine, I had great fun. Very interesting about the poison dart frogs. I will share that piece of knowledge with my little guy. Thank you for the bit of sunshine. I don’t mind snakes, but I think the frogs are my favourite of the pictures you posted. Thank you so much for your kind comment. Thrilled that you got to enjoy these fun frogs with your little guy.